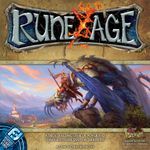 A deck building game set in Terrinoth (Runebound, Descent: Journeys in the Dark, Runewars, and DungeonQuest). With unique factions and multiple scenarios this game changes things up from the standard deck builder formula. Components are all in good condition.